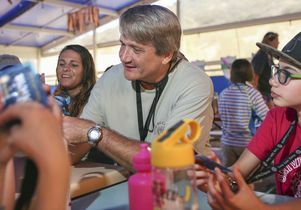 Dr. Kevin Shannon at lunch with camp counselor Daria Stancikas, to his right, and 11-year-old camper Julia Young at Camp del Corazón. On the mainland, he may be known as Dr. Kevin Shannon, associate professor of pediatrics at the David Geffen School of Medicine at UCLA. 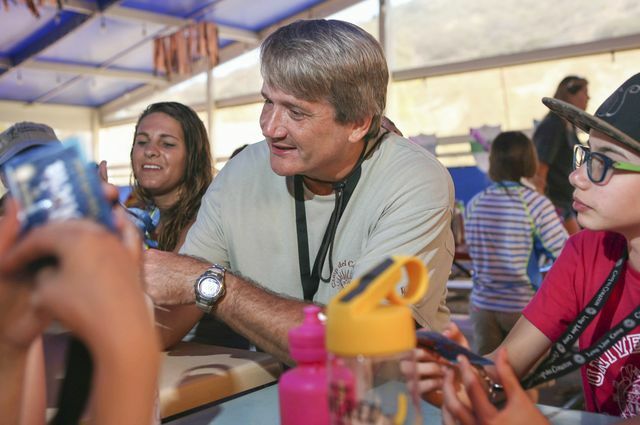 But on Catalina Island, about 20 miles off the coast of Los Angeles, he answers to "Big Kahuna," his handle at Camp del Corazón, a sleep-away summer camp for children with heart disease that he started in 1995 along with UCLA nurse Lisa Knight. As a pediatric cardiologist at UCLA Children's Heart Center, Shannon specializes in electrophysiology, the diagnosis and treatment of conditions relating to the heart's electrical system. His young patients come to him with abnormal heart rhythms, which can take the form of lightheadedness, weakness, heart palpitations or fainting. Decoding the heart's electrical system appeals to Shannon's interest in engineering, the field he expected to enter as a physics major at Haverford College in Pennsylvania. He changed paths after realizing he disliked working alone. In medical school at Columbia University, he knew he wanted to work with children and became intrigued during his cardiology rotation. "I understood physics and hemodynamics and electricity," he says. "It was fun to figure out what was wrong with a particular heart and why it was acting a particular way." Camp del Corazón ("Camp of the Heart") came as a result of Shannon's experience with a 10-year-old patient who had successfully undergone valve-replacement surgery at his recommendation. While doing a follow-up exam on the boy nine months after the procedure, Shannon noticed how his patient carefully avoided revealing his scar. "I was watching him go through these contortions with his shirt, and the euphoria (of curing his heart condition) went out the window," he says. "I realized that what I'd done, in his mind, was traded a problem no one could see to a problem everyone could see." Shannon thought the boy would benefit from interacting in a camp setting with other children who also had scars resulting from heart procedures. In 1995, only two such summer camps existed in the country, and the boy's mother balked at sending her son out of state. So Shannon and Lisa Knight - a pediatric electrophysiology nurse at UCLA who is now also executive director of the camp - set the wheels in motion that April to start a camp in Southern California and welcomed 49 cardiac campers in September. 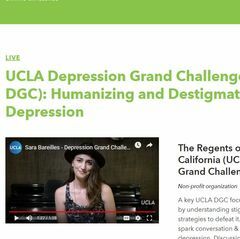 Click image to see a video about the camp. Today, Camp del Corazón runs three sessions and brings about 350 campers, ranging from ages 7 to 17, to Catalina Island for five days and four nights of adventure, activity and silliness. Children with such medical conditions as heart transplantation and heart failure might not otherwise have such opportunities, either because other camps are not equipped to deal with their medical needs or their parents don't feel comfortable sending them. Accredited by the American Camp Association and funded entirely by donations, Camp del Corazón is free to participants and is staffed by volunteer counselors, nurses and physicians - about 230 of them this past summer. 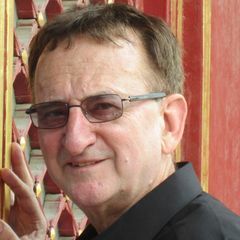 Knight currently serves as executive director of the camp. "This place holds a magical place in your heart," says Colby Rycus, 23, who at age 7 underwent open-heart surgery to repair a defect in the veins leading from her lungs to her heart. Now a counselor for her fourth summer, Rycus - aka Kool Bee - attended as a camper for 11 years. "My best friends are from this camp. You have an underlying connection even if it's not visible to the naked eye and even if your (heart) conditions are different." Shannon understood the value of camp after being a counselor at a day camp while a student in high school and at a sleep-away camp the summer between graduating college and starting medical school. Even so, he finds that campers aren't the only ones who benefit. "Doing this gives me a completely different understanding of what these children live with," he says. He encourages UCLA fellows at the medical school to do their pediatric cardiology rotation at Camp del Corazón so they will gain this valuable perspective. His volunteer activities extend beyond camp. Over the years, Shannon has traveled on 10 medical missions to South America to provide medical care to children with congenital heart disease. In April, he spent a week in El Salvador and performed 23 cardiac ablations, a procedure to neutralize heart tissue responsible for aberrant electrical impulses that cause abnormal heartbeats. Although Shannon doesn't consider himself an athlete, he is certified as a lifeguard, a lifeguard instructor and an archery instructor. He also works with athletes, screening not only his pediatric patients who play sports, but also UCLA athletes and members of the NBA's Los Angeles Lakers for heart abnormalities. Based on his findings, he will either clear them to play or deliver the devastating verdict that they can no longer participate in competitive sports. For all of his patients, however, Shannon focuses on what they can do instead of what they can't. "Our goal is to balance the treatment and the disease to make life as normal as possible and as long as possible," he says. "But normal supersedes long. Because there's no point living forever if you're miserable." Back at Camp del Corazón, Big Kahuna has just returned from the kayak excursion. 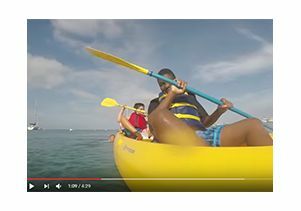 "Great job paddling," he tells his boat mate, 11-year-old Sofia Manalang. "We make a great team." The smile on Sofia's face tells him all he needs to know. This story originally appeared in the Fall 2016 issue of U Magazine, a publication of UCLA Health and the David Geffen School of Medicine. Dr. Kevin Shannon, associate professor of pediatrics and co-founder of Camp del Corazón. https://www.youtube.com/watch?v=EaWwMrG_69g Screenshot from Camp del Corozon video.